Brad Cloepfil, Founding Principal of Allied Works Architecture, will discuss the firm’s design process, creative work and notable projects (such as the National Music Centre of Canada, in Calgary, the National Veterans Memorial and Museum in Columbus, OH, and The Clyfford Still Museum in Denver) presented through the lens of their exhibition entitled Case Work: Studies in Form, Space, and Construction. Case Work offers an inside view into Allied Works Architecture’s unique approach to design, a process driven by a rich material and physical investigation. For Brad Cloepfil and Allied Works, each project begins with the creation of hand drawings and concept models. These highly evocative artifacts—forged of diverse matter such as reclaimed timbers, porcelain, resin, glass, lead and steel—distill the essence of each project, and explore the dialogue among material, technique and intention that lies at the heart of architectural practice. 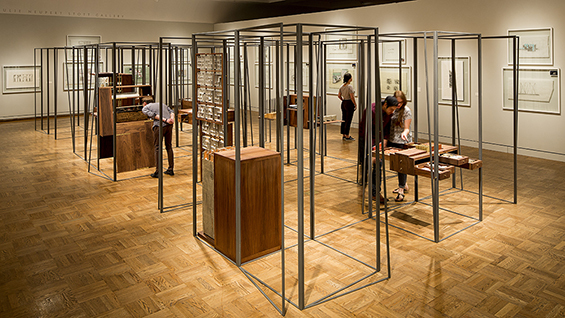 The exhibition presents a series of custom-built cases, which open up to reveal a collection of artifacts inside, including models, drawings, material samples, and other studies that have provided conceptual inspiration. Each case is inspired by the artifacts and investigations it houses, and serves as a means of extension, engaging the body, the hand, and the eye. Curated by Dean Sobel, Director of the Clyfford Still Museum, the exhibition places the firm’s work in context, and explores how this singular collection of artifacts reveals the process of creation in architecture—the act of translating ideas into built form. Brad Cloepfil is the Ellen and Sidney Feltman Chair. This lecture is made possible by the Ellen and Sidney Feltman Fund established at The Cooper Union to advance the principles and benefits of lighting design through the exploration of the practical, philosophical and aesthetic attributes of light and illumination. The event is free and open to the public. General public should reserve a space here. Please note first come, first seated; an RSVP does not guarantee admission. All registered seats are released 15 to 30 minutes before start time, so we recommend that you arrive early.